Usually, you talk about something being the keystone of something else: "Communication is the keystone of a relationship." You might mention a keystone in general when your meaning is clear ("That product line lost its keystone") or add a description before the word: a cultural keystone, a pop music keystone, a weight loss keystone, etc. And, every now and again you'll see "keystone" used like an adjective, mostly in the phrase "a keystone species." A delicious tortilla is the keystone of a burrito. You can have the freshest beans and veggies and an amazing homemade salsa, but wrap it all up in a dry, tasteless tortilla and the whole thing is ruined. Children's sense of being respected is the keystone of the trust they place in a tutor. Look away from the screen to explain the definition in your own words. 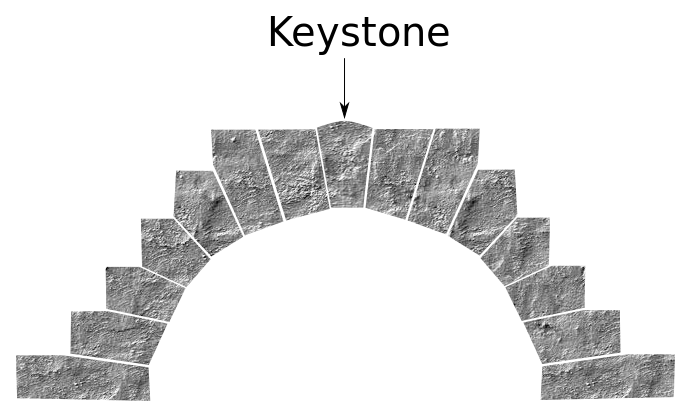 You’ll know you understand what "keystone” means when you can explain it without saying “support" or “mainstay." Think of an important thing that helps your city, town, community, school, or workplace thrive, and fill in the blanks: "_____ is one of (Place)'s keystones." Example: "Tourism is one of Hawaii's keystones." 2. Most of us have forgotten the details we learned in science courses but retained the keystones, like _____.